Chester Creekside Cabin is a beautiful, historic country home set amid large, rolling lawns. Built in the 1900s, this graceful home has been fully restored. Newer additions have retained the home’s original charm while enhancing it with spacious living quarters and modern amenities. With a creek running through the property, a picnic table under a majestic pine tree, and lawns on two sides, Chester Creekside Cabin is an ideal place for the entire family to gather. It is located in Old Towne Chester in a quiet, historic, residential neighborhood that is perfect for strolling. Chester Creekside Cabin is walking distance to shops, restaurants, and coffee, and a 10-minute drive to Lake Almanor. Swimming, golfing, biking, hiking, ATV riding, and boating are available nearby. The home is professionally designed, with an open floor plan that provides a comfortable flow between the living room, dining room, and fully-equipped kitchen. The dining room table seats 10. The roomy master suite has a new queen bed and a large bathroom with a shower. Also located downstairs is a second bathroom, with a shower as well as an oversized bathtub. Upstairs there are three charming bedrooms. One bedroom has two twin beds, the second has one twin bed, and the third has a full bed. A large covered porch provides another beautiful space for friends and family to gather. Overlooking the tranquil lawn and bubbling creek, the porch is an ideal setting for enjoying a book, a glass of wine, a sunset, or a conversation. 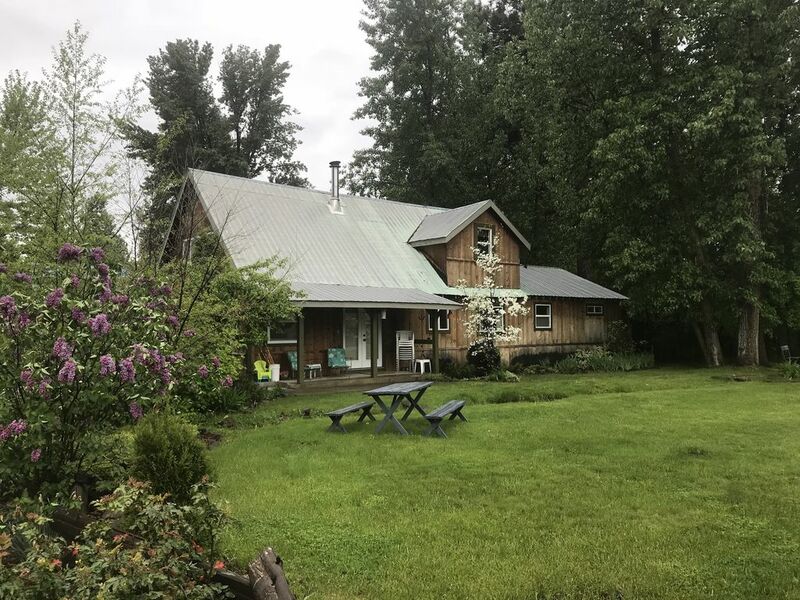 This beautifully appointed home includes an outdoor barbecue, linens, laundry facilities, DVDs, books, board games, children’s items, picnic supplies, plenty of wood for the wood stove, and lots of other resources to make your stay at Chester Creekside Cabin hassle-free and fun! Propane heater in kitchen, electric heat in master bedroom and bathroom. Wood burning fireplace provides heat in living room and upstairs bedrooms. Youtube and Netflix can be streamed from the video player onto the 20" monitor. You need an account to use Netflix. Player provided along with 20" Computer Monitor to watch movies on. Board games provided for adults and children. A small DVD collection in the book cabinet. A lawn with a creek running through it that is up to three feet deep. A charming place to stay! Great for the whole family and more! Ted, the property owner was super accommodating. Due to the weather he allowed us to check in early to beat the terrible roads at night. The house was fully stocked and once the fire was going became super cozy. It’s defnitiy not a modern house. It has a nice rustic charm and history. We all had a great time and hope to come back in the future! Charming cabin in sleepy town. We enjoyed some quiet time in snow. The cabin was very clean and orderly with plenty of cooking implements. A short trip to Lk. Almanor and Mt. Lassen. We will stay again. Wonderful Vacation spot, even in the winter! We wanted a low key holiday without the fuss and possibly snow. This house was a great home away from home! The kitchen is well-stocked with most every kind of utensil and cooking instruments you could need for a short (or long) vacation. The wood stove worked wonderfully to heat the house, no issues at all with regard to heat in the upstairs bedrooms. The close proximity to Lassen National Park provided us with the deep banks of snow to go sledding with the kids. Would love to spend a summer here to enjoy the Lake and hiking the Volcanic park. The only slight reservation I would have is that it is across the street from a small RV park, not sure how busy/noisy it would get in the summer time. Otherwise, a very well-kept, well-loved home, definitely worth it! Great older home. Very relaxing had a great time. Cozy home, had a great time. This was the cutest house with a gorgeous back yard with a little stream running through it. Pleanty of space. The kitchen had literally everything you could ask for. Perfect for cooking family dinners. We would definitely book here again. Charming country home, close to incredible state and national parks and well located! We enjoyed the lovely stream, croquet set and charming home. We visited Lassen multiple times and Burney falls, and of course Lake Almanor. Home is well located for walking to coffee, restaurants, etc. Internet Service Provided by Digital Path. Weekly rates start at $15.00. Free Internet available at the Coffee House which is a three minute walk from the house. Security Deposit will be returned with in ten business days after check out.